After a great deal of consideration and planning we have put together the classic family road trip vacation. We are packing up the Griswold Family truckster and traveling across America. Our road trip will take us from Atlanta GA to Los Angeles CA over ten days and countless “Are we there yet” chants from Amber and Brooke. We will be stopping at unique family destinations like The Big Texan to take the 72 oz steak challenge, the Cadillac Ranch to doodle and show off our artist skills on the ten Cadillac sculpture, spend the night in a Wigwam at the Wigwam Motel, and of course seeing the Grand Canyon. The road trip will take 10 days to complete and we will be driving in an exact replica of the Griswold Family Truckster, like in the National Lampoon Vacation movie, from Atlanta GA to Los Angeles CA. The Family Truckster that we will be driving is a 1984 Ford LTD Country Squire. It’s your classic station wagon that everyone remembers sitting in the wayback as a child and looking out the window as the road goes by. The biggest concern is will we make it? 10 days on Route 66 is a long time in the heat of summer with such an old original car. But we think the truckster is up for it and we are up for the adventure. Our road trip will start in Atlanta GA at Six Flags Over Georgia for a fun filled day at the park. Summer time and roller coasters, funnel cakes, and smiles just go together and it’s a perfect way to start our Summer vacation. We will then be heading on Route 66, which none of us have ever been on before, and we are very excited to see all the classic tourist attractions, diners, and hotels along the way. We want to surprise you with the some of our stops we will be making along the way, but I can say we will be stopping at the Grand Canyon, and some historic spots, and some new more modern Route 66 attractions. Of course we will be going to Walley World (Six Flags Magic Mountain) to ride Colossus, the wooden roller coaster that is in the Griswold “Vacation” movie. Colossus is closing in August so we will be there to say farewell and ride the wooden coaster one last time. Please come along with us on our road trip, it’s going to be loads of fun. We will be posting our road trip adventure LIVE as it happens on Facebook, Instagram and Twitter. 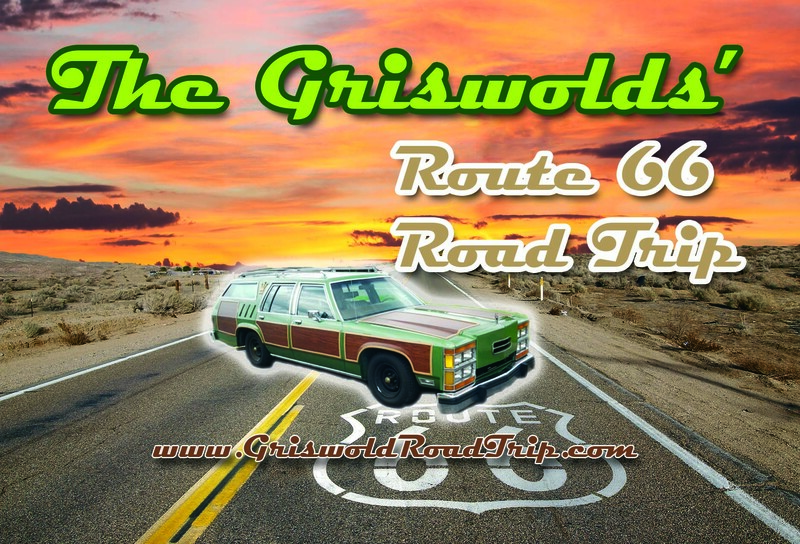 Also at the conclusion of our road trip we will be putting together some fun Griswold webisodes that you can watch right here on our www.GriswoldFamilyVacations.com website. On this Griswold Vacation Road Trip we stop at the Grand Canyon at the El Tovar Lodge just like in the National Lampoons Vacation Movie. We then drive over to Delgadillo’s Snow Cap Drive-In on Historic Route 66 and get a little ice cream while meeting everyone in this small town that inspired Pixar to create the Cars Films and Radiator Springs. We then took the most amazing drive on our 3,000 mile trip across America on Route 66 to CA. Yea it was a little scary being the only car for hours out in the desert with nothing around, but we saw some of the most amazing views and the inspiration for the Pixar Cars movie. It was going to happen, but I was hopeful that the truckster would only break down once during our 10 day road trip across America. We head to Santa Rosa New Mexico and also the Wigwam Motel #6 in this episode on our Griswold Family Vacation. We are off to Amarillo Texas to our next Griswold Vacation road trip stop, the Big Texan. We spent the night at the Big Texan Hotel and had an amazing steak dinner. We also did the 72 oz steak eating challenge. This was one of the highlights of our ten day trip across America. Bobby and his team at the Big Texan are the friendliest folks you are ever gong to meet and we were instantly part of their family. If you are traveling across Route 66 this is a must do! Say Hi to Bobby and the folks for us. We head from Pop’s Soda Stand on Route 66 on our last episode to Amarillo Texas to express our creative side at the Cadillac Ranch. Yes you get to spray paint Cadillacs. We also met up with our friends from CCN and CCTV to help with their Explore America Route 66 Television series. 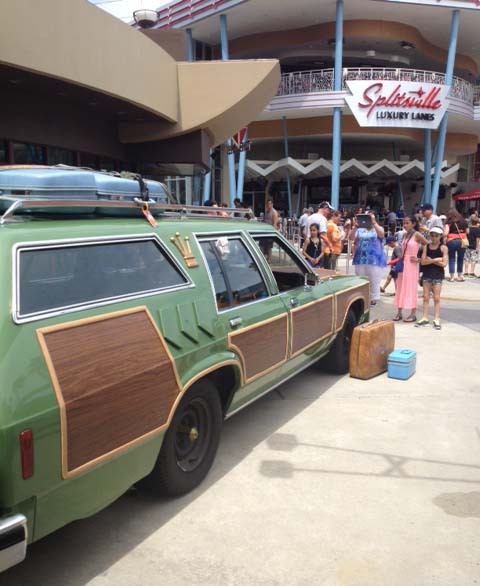 The Real Life Griswolds road trip from Atlanta GA to Los Angeles CA to Wally World. On this journey we stop in Memphis TN at the Madison Hotel, Tour Elvis’ mansion at Graceland and head to Oklahoma City, Arcadia to POPS soda shop. We also take in some fun road side attractions along the way. 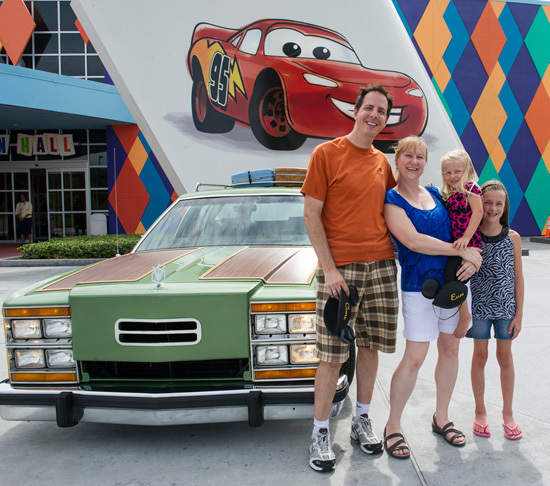 Have you been on a family road trip across the USA with your kids? I would love to hear about your travel adventures. Please share your family road trip memories here with all of us. We’re hoping to take this route tomorrow from Atlanta to Los Angeles! Any suggestions for making it a four day trip out? We have a sixteen yr old boy. Sorry, just saw your comment. I hope you had a great road trip. For future trips I would get the RoadTripper App. It’s free and shows you all sorts of fun tourist attractions, resorts, and unique places to dine.